Assembly - Preheat the oven to 350 F. Place eight 3-inch individual tart rings on a parchment lined baking tray. For the crust, stir the flour and cocoa powder together. Stir the melted butter and honey together and add this to the flour, mixing until blended (the mixture will seem dry and crumbly). Divide this between the tart shells and press it flat. Bake the crusts for 10 minutes and then cool before filling. For the vanilla swirl, whisk the egg yolks sugar and water, along with the scraped seeds of the vanilla bean (or paste, if using) in a metal bowl placed over a pot of gently simmering water until doubled in volume and the eggs hold a ribbon when the whisk is lifted, about 3 minutes. Remove this from the heat and gently whisk in the mascarpone until smooth. Set aside while preparing the chocolate swirl. For the chocolate swirl, melt the chocolate by gently over the simmering water, then set aside. Whisk the egg yolks, sugar and coffee in another metal bowl and place this over the simmering water, whisking until doubled in volume and the eggs hold a ribbon when the whisk is lifted. 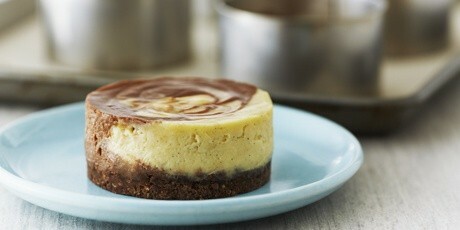 Remove this from the heat, stir in the melted chocolate and then gently whisk in the mascarpone until smooth. Using 2 ladles or 2 pitchers, one for each batter, ladle or pour the fillings onto the cooled crusts, at the same time, gently swirling as you fill. 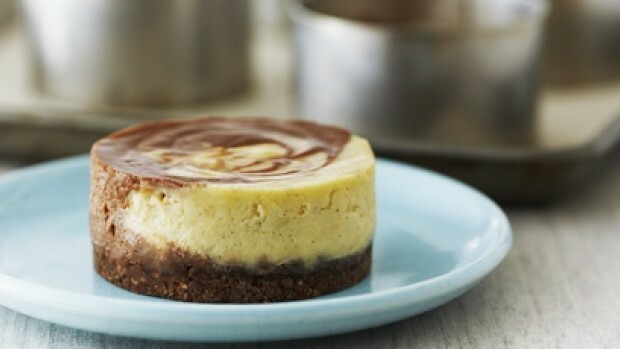 Use a skewer to swirl the two cheesecakes further and then chill then for at least 6 hours to set. To serve, run a small spatula on the inside of the tart ring to loosen and then place onto plates.